I have a sneaking suspicion that the topic of re-reading is about to come to the forefront of this blog as I embark once again on the epic journey of reading Robert Jordan's Wheel of Time Series. 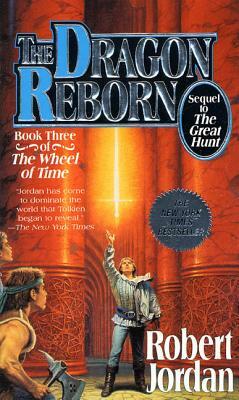 The Wheel of Time currently stands at 12 books, starting with The Eye of the World. The 12th book, The Gathering Storm, is described by the publisher, Tor, as "the first of three novels that will make up A Memory of Light," designed to keep the series within Jordan's original guarantee that it would be 12 books and no more. Sadly, Jordan himself passed away before he could complete the series, but did leave detailed notes for the ending. 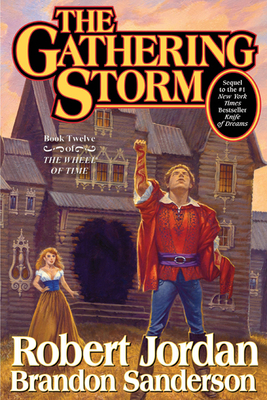 With his wife editing the final manuscript (as she did all the other books in the series), The Gathering Storm (released Nov 2009) was written by fantasy author Branden Sanderson. With each book pulling tome rank, weighing in at around 700 pages, I'm looking at over 8,400 pages of delicious, epic, classic fantasy reading. I'm now well into the third book (The Dragon Reborn, pictured below) of the series re-read, and so far have mixed feelings. I love the series just as much the second time around, if not more so, as I can catch important details that I missed the first time and tie events together with what I know will come in later volumes. I've spent so much time with these characters that at times I find myself wishing I could scream into the book "NO! DON'T DO THAT! TRUST ME, I KNOW WHAT WILL HAPPEN IF YOU DO!" As I re-read, this familiarity with the characters, and with the overall development of the plot, is comforting. I am taking this journey with them as an omniscient follower, finding out where it will lead, each new chapter bringing back vague recollections of what is to come. But I am simultaneously astounded - yes, astounded - at how much of the books I have forgotten. I read the series for the first time three years ago, so it's not as though it's been decades. The general storyline is there in my head, but the individual actions of each character are gone from my memory, and re-reading this series is not like hearing a familiar voice repeating words in my head (which is what happens when I re-read Harry Potter... but then I've read those dozens of times). It is not necessarily a bad thing, this overlapping knowledge and troubling lack of knowledge. I know the characters, and I remember who lives, who dies, and the general arch of the plot. Forgetting the details - who, precisely, is batting for the other team, for example - allows me to relive some of the suspense of my first read. At the same time, it alleviating enough of the tension to give me a chance to slow down through read #2, taking time to enjoy the masterful details of Jordan's near-perfect fantasy world creation without sweating bullets over who will live to see the next chapter. As I go forward, some of this is strict remembering (in that I remember exactly what I am reading, almost word-for-word), some is recalling (as memories are stirred by events in the story) and still other parts are true re-read (as I read them much as I did the first time around). What about you? Do you remember details of past reads, or just have general impressions of the stories? Do you enjoy re-reading, or is it tediously dull to you (as I've heard some say)? Those are quite possibly my favorite fantasy books ever. I've read the whole series several times, and I plan to do it again this summer. I'm looking forward to it. I know exactly what you mean, though. Even though I have reread the series a few times, I still feel like the characters' little actions are new. I'm still surprised sometimes. For me, this is the series that rivals LoTR. I've read it several times too, usually when a new book comes out. I've been itching to reread again but am trying to wait till the last two books are published. Each reread of a beloved book is like a new journey on a well traveled road. Never dull to me. I always pick up on new things each reread. I hope it is because I'm continuing to evolve, learn and gain new insights--- and not because I'm getting forgetful!! !